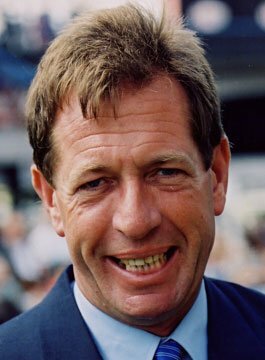 Derek Thompson is veteran Horse Racing Commentator and Presenter. Derek has been synonymous with horse racing for over 30 years. A former jockey with amazing tales from the weighing room ‘Tommo’, as he is known throughout racing, even once beat HRH Prince of Wales whilst racing at Plumpton. Derek Thompson has spent his life working in broadcasting and with horses, beginning his career as an assistant trainer in the U.K. and France, whilst at the same time learning the tricks of the reporters trade as a part time racecourse commentator and reporter. The BBC saw potential in the 22 year old and enlisted his talents to present sport for BBC Radio and The World Service which, as a measure of his true professionalism, included the presentation of no less than 9 Grand Nationals. Television beckoned and very soon ‘Tommo’ was a regular face on the ITV on World of Sport, subsequently joining Channel 4 Racing in 1985. Known as the professional’s professional, Derek Thompson presented the popular Morning Line on Saturdays and whilst travelling in excess if 100,000 miles a year to all parts of the globe, can be heard relaying tales of his racing history in a way only Tommo could! Tommo now presents for At The Races and Radio Five Live. In his first book Tommo’s Year, Derek recounts fascinating tales from tracks around the world.